And this would be a good idea with potatoes too if you come across any bulk bargains! Potatoes are a whole different thing - they don't freeze well unless they are cooked or at least partially cooked. No, you can freeze them raw. Just make sure you freeze them in portions you will use - they are very hard to break up if frozen in one huge clump. A great tip my clever daughter taught me is to wear swimming goggles when peeling and chopping a lot of onions. Saves tears!! I always using a plastic lining/bag inside a container or I double bag onions for the freezer otherwise I find there is an odour left behind!! I also make Caramelised Onion Jam which is a hit with meat eaters. 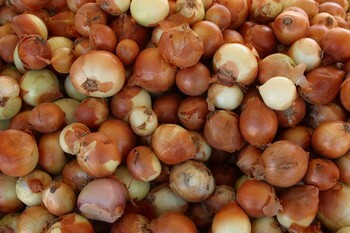 It is a great way to use quantities of onions and keeps well. It also goes well with burgers and would be fine in stews and mince dishes.